Pine representation of a snake, carved and painted in various shades of green, with a red leather tongue. Quebec pine; carved and coloured with waxes and finished with beeswax. The snake has a red leather tongue and a concealed bell in its tail. Blues, greens, red and yellow. The piece of wood is cut in two vertically except for the head and tail and temporarily glued together again. It is then carved and the colour applied and rubbed in. The segments are carved and separated along the cut line and articulated by leather which is held in place with glue and dowels. 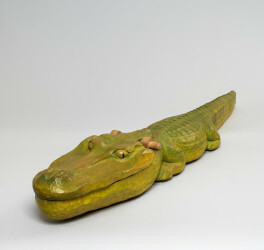 Carved Articulating Snake, Howard Raybould, 1979, Crafts Council Collection: W34. Photo: Todd-White Art Photography. In the context of my work it represents something about the way I feel 'qaulity' or whatever you like to call, should be present, or can be present in toys, or other areas that are often regarded as ordinary. Does that make any sense?